Will Work For Buttons: Pastel Winter Wonderland!!! Who says that winter has to be dark and gloomy. This Tiddly Inks Fab Friday I decided to break free of the traditional winter blues and create a Pastel Winter Wonderland card! 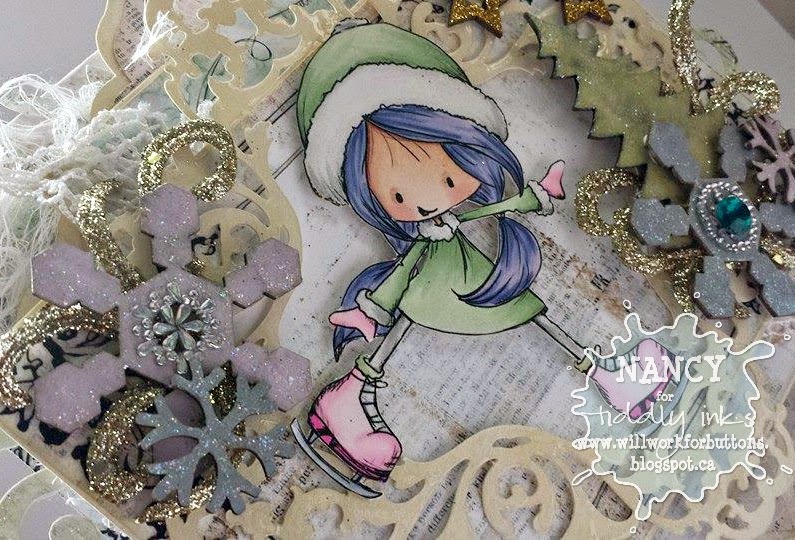 Letting me introduce you to the adorable Skater Wryn she is a digital stamp from Tiddly Inks. She is Printed on Curious Metallics Cryogen White card stock. She has been colored with Copic markers. The papers used are all from the Prima Marketing Epiphany Collection as well as the Curious Mettalics White Gold card stock which was used for mounting and for the diecut frame. The Frame was cut using my Silhouette Cameo. The embellishments are from Harmonie paper compnay (chipboard) , Prima Marketing (Bling), and left over Christmas floral stems (gold swirls). The chipboard peices have been customized with Tim Holtz Distress Paint and Stickles. All embellishments and papers were distressed with Tim Holtz Anitque Linen Distress Ink. The finishing touches are a few scraps of vintage lace as well as some cheese cloth scrapes. I hope you have enjoyed this card as much as I enjoyed making it. Please leave me some feedback because I love hearing from you. Make sure you stop on by the Tiddly Inks blog and check out all the other Design Team creations and give them some love!!! Great card! I'm loving all the sparkle. Gorgeous! I love all the little bits and pieces! So perfect!